Coates took the stage to introduce Ocasio-Cortez as someone who embodies the legacy of King in the current political sphere, referencing her efforts to link ideas of economic justice, racial justice, and foreign policy. 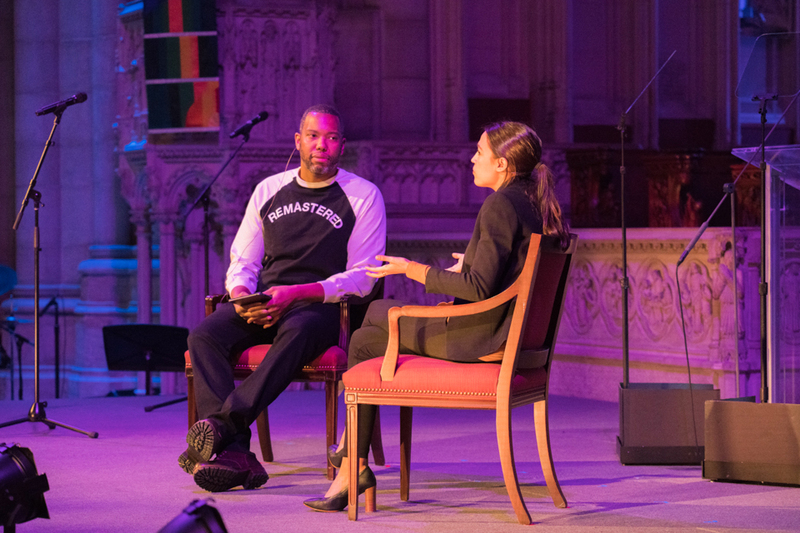 New York Congresswoman Alexandria Ocasio-Cortez joined journalist and renowned writer Ta-Nehisi Coates to discuss political activism, the need for urgent advocacy, and the nature of “clapping back” at Twitter followers at an event to honor the legacy of Martin Luther King Jr. in Riverside Church on Monday afternoon. Sponsored by Blackout for Human Rights, a collective organization dedicated to addressing human rights abuses against African Americans, the event brought together a series of speakers with the goals of inspiring action, celebrating the legacies of past and present leaders, and creating an inclusive space for communities. Special guests featured in the program—titled MLK Now 2019—also included “BlacKkKlansman” actor John David Washington, “If Beale Street Could Talk” actor Colman Domingo, and civil rights leader Rashad Robinson. As a reminder of King’s intersectional political platform, the event was held in Riverside Church, where King gave his famous speech, “Beyond Vietnam: A Time to Break Silence,” in 1967, which condemned the war’s deleterious effects on both the poor and Vietnamese peasants. After a brief presentation by “Black Panther” director Ryan Coogler, Coates took the stage to introduce Ocasio-Cortez as someone who embodies the legacy of King in the current political sphere, referencing her efforts to link ideas of economic justice, racial justice, and foreign policy. Ocasio-Cortez approached a variety of topics with Coates, including her beginnings as a politically-conscious person in a first-generation household and the differences she saw between living in the more affluent Westchester and an under-resourced Bronx. Citing her upbringing by her parents, Ocasio-Cortez said that her childhood taught her to deal with opposition that aims to downplay her political efforts through personal attacks on her race, class, and background. In response to a question about her infamous heated battles with Twitter opponents, Ocasio-Cortez emphasized the need to challenge commonly ingrained assumptions that are spread and accepted by leaders on social media. “It’s not just reflexive self-defense—I’m trying to dismantle some of the frames of misogyny, classism, racism that we just allow to go on,” she said. In light of King’s legacy as an activist, Ocasio-Cortez also spoke of the pivotal role activism has in enforcing and inspiring change within public office, which she defined as a role meant to reflect discourse rather than lead it. Both speakers referenced the complex history of King’s activism, which often focused on the intersection between race and economics, an idea featured in his final sermon at the National Cathedral in Washington D.C.
Coates and Ocasio-Cortez concluded their conversation with a discussion on youth involvement in politics. Ocasio-Cortez called on activists to recognize the urgency of their work, defining her main goal as opening the door for future generations committed to political change and justice. “Right now with the current circumstances, with the abdication of responsibility we’ve seen with so many powerful people, I feel a need for all of us to breathe fire,” she said. Alexandra Ocasio-Cortez Ta-Nehisi Coates Political activism Riverside Church Martin Luther King Jr.